What is metabolism and what affects it? Metabolism is the process of converting food (calories) into energy. The efficiency with which your body does this is referred to as your metabolic rate. Many factors affect a person’s metabolic rate: weight, age, body composition, hormone levels, and gender making it a highly unique number specific to you. What is Resting Metabolic Rate (RMR)? Your Resting Metabolic Rate (RMR) is the number of calories your body will burn every day at rest, just to stay alive. Our Metabolic Analyzers utilize the same laboratory technology as ICU metabolic testing equipment. Because every calorie a person consumes requires a fixed amount of oxygen to be converted to energy, our Metabolic Analyzer measures the oxygen you consume to calculate calories burned. 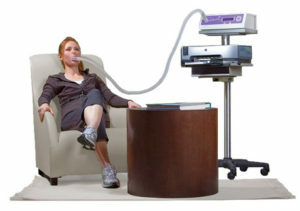 All the air exhaled by the patient must be collected to measure oxygen consumption. Two one-way valves ensure that only fresh air is inhaled and all exhaled gas passes through the hose and into the machine. A nose-clip ensures that all exhaled air is analyzed. It’s important to know how your body is responding and adapting to your restricted calorie intake. Your metabolism has been shown to slow too rapidly if your caloric intake is restricted too much, or if you knowingly or unknowingly eat too little. And once you’ve reached your goal weight, your caloric intake must be slowly increased to allow for your metabolism to return to normal while minimizing and weight gained back. How do you use the results? We measure this and multiply it by an activity factor to estimate your daily Total Energy Expenditure (TEE). We then take your TEE and adjust your Meal Plan’s calories based your individual weight loss or gain goal. How often do you need to test it? We recommend measuring your RMR every 4-8 weeks to ensure that your metabolism is adjusting as we expect it to. We will also measure your body composition, weight, and circumference measurements every 4-8 weeks and make any changes to your meal plan based on the fluctuations in these values.